Welcome to the first blog of 2018. Happy new year to one and all and I wish you and your family a fantastic year and may all your golfing ambitions come to fruition. I'm starting with a product review (the clue is in the title!) and this looks at the Puttout training aid and the accompanying mat. I was lucky enough to receive one of the training aids to review by Puttout and a big thank you to Patrick and Charlotte for sending this and giving me the opportunity. As always, there is a video review of the products and you can see both in operation and you can check out my Youtube review here (Puttout Review). 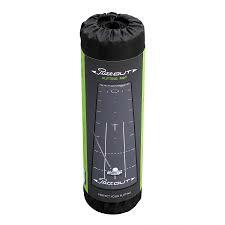 There is also a chance to enter the competition to win a Puttout training aid. Not a bad way to start the year and it's open to anyone, so even if you're not in the UK, please feel free to enter and I'll make sure you get it wherever you are in the world. Lets start then with the training aid. There are a myriad of putting aids out there. However, I firmly feel this is one of the most innovative, and more importantly one of the few that actually match expectations and improve the putting stroke, particularly in terms of feel. It is a compact design and folds up nice and small and fits inside any golf bag and could be used at the golf club, at home or in an office. On the base are a number of sharp plastic spikes that ensure the Puttout will sit on any carpet or on the putting green and stay in place. So what is it? Well in simple terms, it consists of a hole sized rubber base and a parabolic ramp. This ramp will only accept a ball struck on line and at a reasonable speed and will throw off any that are not quite on line or hit too hard. It works in a simple but effective manner too. The ball will travel up the ramp and the distance it returns towards you represents the distance past the hole the ball would have gone. Now if you are like me and struggle at times from six feet and beyond to control the pace of putts and can often run the ball a troublesome distance beyond the cup and leave a tester coming back (three putt hell) then this device is perfect for learning and ingraining distance control. Depending on who you listen to, the optimum distance to get the ball past the hole to give it the best chance of going in is 12-18 inches and so by using the Puttout regularly you can train a stroke that gets the ball returning down the ramp that ideal distance. You can see that in the video. I haven't finished yet. 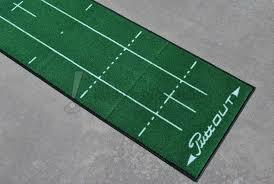 As well as the Puttout training aid, thy have now released a putting mat to sit alongside. Now let me be perfectly honest and upfront, I am not a huge fan of mats. I find many, crease up and make it hard to make a decent putt, many are either way too slow or run at an Augusta pace that is unrealistic. Many are poorly made and fray or fall apart. I was given the Puttout mat as a Christmas present and was a little wary based on my previous experiences. It comes in two colours, a traditional green version and a stylish slate grey colour. It's not small, and gives you a chance to putt up to six feet and so with an additional area behind this, it comes in at around eight feet in length and so it is something you may need to bear in mind. Indeed, the only two places I can really use it comfortably are the hallway or the bedroom. The tube and bag does make it very simple to store and sit out of the way. Again, this has been a bugbear of other mats and they've often not rolled or folded away compactly and always seem in the way. This takes very little time to roll out and then simply rolls up again, sits inside the cardboard tube and inside the bag. The base is made of sturdy rubber and I've had the mat on a tiled floor and carpet and it has sat in place on both. The mat can be used in either direction. There is a mark in the centre where the Puttout training device can be situated, but if used the other way, there is an end section, box shaped where you can simply work at stroking the ball into to work on feel. It is however when putting towards the training aid that the mat is at its best. There are alignment lines to the side where you can set up and work on the basics and ensure the club, body and shoulders are all in the correct place. Puttout are saying that the mat runs at the equivalent of 10 on the stimpmeter and to my mind that is fairly representative of a good speed of the greens at the majority of members clubs around the country. Of course there will be those that have greens that are quicker and slower but as an average I think it's pretty good. I happen to think their judgement is also fairly accurate having used it over the festive period and tried it on the practice green at my own club. There are clearly defined distances laid out on the mat at intervals from a foot up to six feet away so it is perfect for developing a perfect stroke and more importantly the perfect feel from a variety of distances. I have done a review on another product, the No 3 Putt (No 3 Putt Review) which is a device I use on the practice green at my club and has been in my bag for many years now, and I have said that repetition breeds confidence and I feel when using the No 3 Putt and now the Puttout that I can play on the course and have great belief in my stroke and feel and can stand over a putt reliant on the work I've put in and simply focus on a good line and trust my stroke. Putting with such freedom, and devoid from too many thoughts makes a big difference. Let me finish by giving you my thought on the Puttout putting mat. Sorry it's a long one to start the year but as always with these independent, mid-handicap reviews I want to give you comprehensive and honest opinions on each product to help you decide if it is something you would consider buying and using. I make no apologies for that. I hope you find this one (and all the others) useful. If I am being honest, the Puttout training aid is a great product and as a stand alone is a worthwhile purchase, but, I do feel the Puttout mat is a decent product and together provide a very pleasing duo. Thank you for your support in 2017 and especially to those that took the trouble to watch the video links I've included. I am keen to make my Youtube channel (please take a look here - Three Off The Tee Youtube) a really interactive place, and hopefully provide some content you enjoy, and more importantly want to you to respond to. I want to be grow it and as I do be able to offer some great opportunities and giveaways. If you have watched the video review already don't forget to thumbs up the video and comment to enter the free draw to win a Puttout training aid. Please help to make it a bigger and better place in 2018. Many thanks for your support.